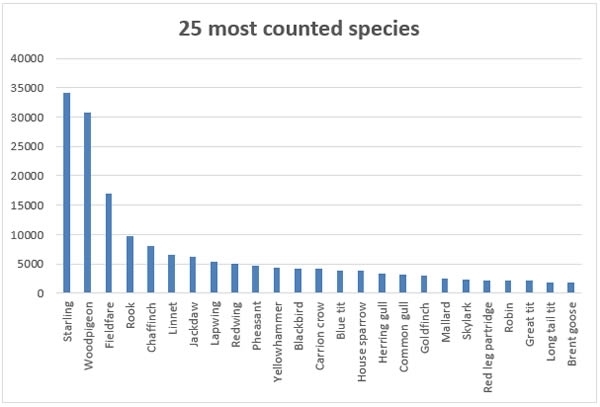 February saw the fifth annual Big Farmland Bird Count (BFBC) organised by the Game & Wildlife Conservation Trust, and sponsored by BASF, with record numbers of participants and species recorded. The five most abundant birds seen were starlings, woodpigeons, fieldfares, rooks and chaffinches. A total of 99,712 were found, making up nearly 50% of the total number of birds recorded. It is interesting to note that this top five list is very similar to previous counts. The average farm size of those taking part was 1003 acres, with 69% growing arable crops, 52% having beef or sheep, and 12% growing field vegetables. There were also a number of dairy farms, horticulture units, poultry producers and pig producers submitting counts. We are really pleased to get such a variety of interest. 53% of participants are in some form of agri-environment scheme, demonstrating their long-term commitment to environmental management. 41% of participants were providing some form of extra seed feed for birds, either through growing wild bird seed mixes, or by providing additional grain through supplementary feeding either through scattering seed or providing it via hoppers. Farmers from every county in England took part and there were also responses from Northern Ireland, Scotland and Wales. We also had 32 farmers from Austria take part! 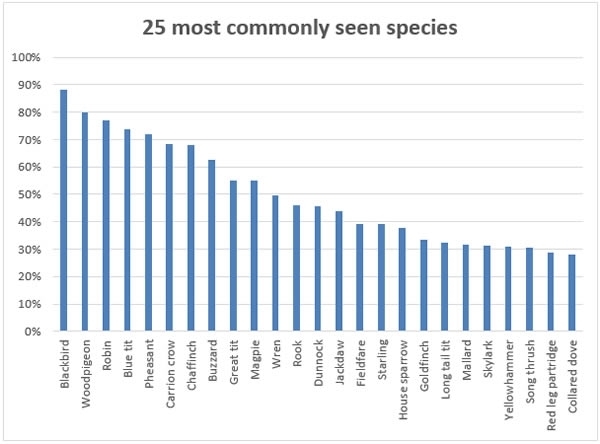 Suffolk had the most returns, with 67 farmers completing the survey. This was followed by Yorkshire with 63, Norfolk with 54, and Hampshire with 47. Our thanks go out to these counties for their huge support. The survey areas included important environmental features such as hedges, woodland ponds, grass margins, ditches and trees. 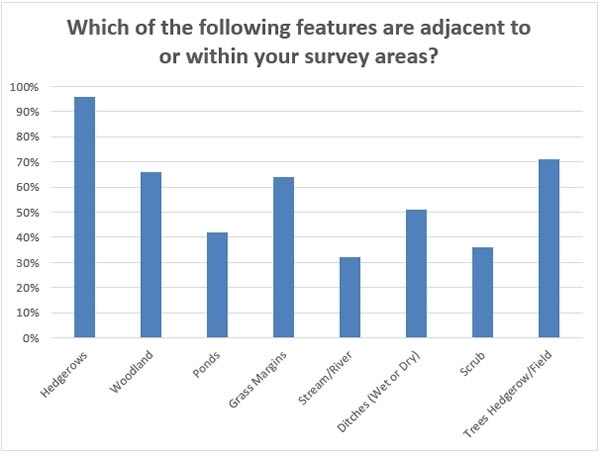 Most survey took place on winter cereals, grassland or overwintered stubbles. The features recorded adjacent to the survey areas are a good demonstration of the variety of habitats present in farmland across the UK.